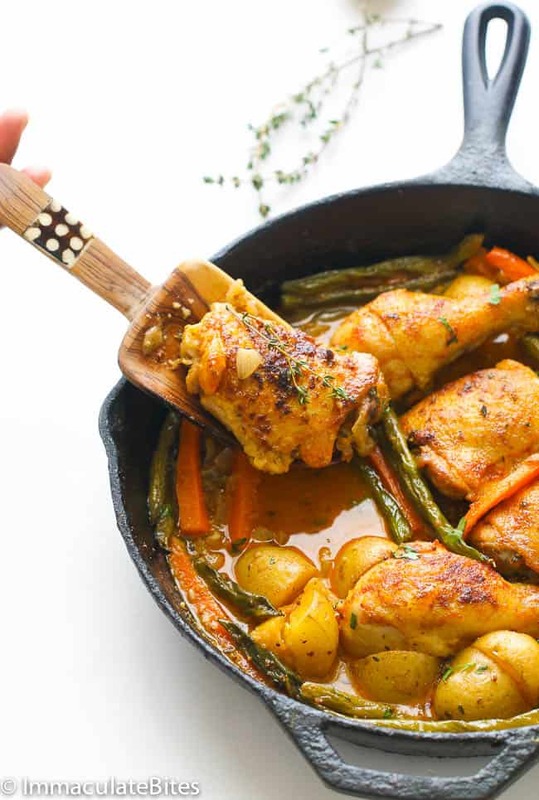 Braised chicken garlic thyme –This one pot chicken meal is cooked to absolute perfection in a flavorful garlic and mustard sauce with potatoes and vegetables. 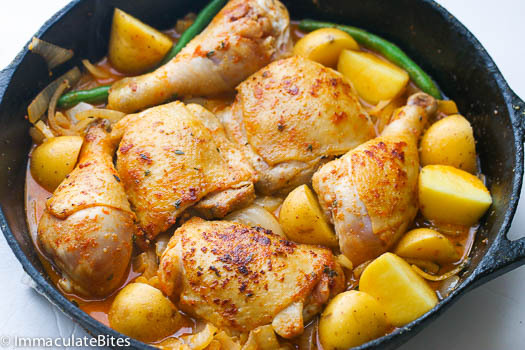 This chicken is a spin off from this Senegalese garlic and mustard chicken here. Had excess amount of thyme and decided to throw it in the mix. Always have a bunch in my fridge and seriously love the flavor – it adds some sparkle and brightens up proteins and soups. First time I made this chicken was without any vegetables or potatoes. The second time around had a few vegetables laying around and thought it would be more appealing with some vegetables and potatoes in the mix. 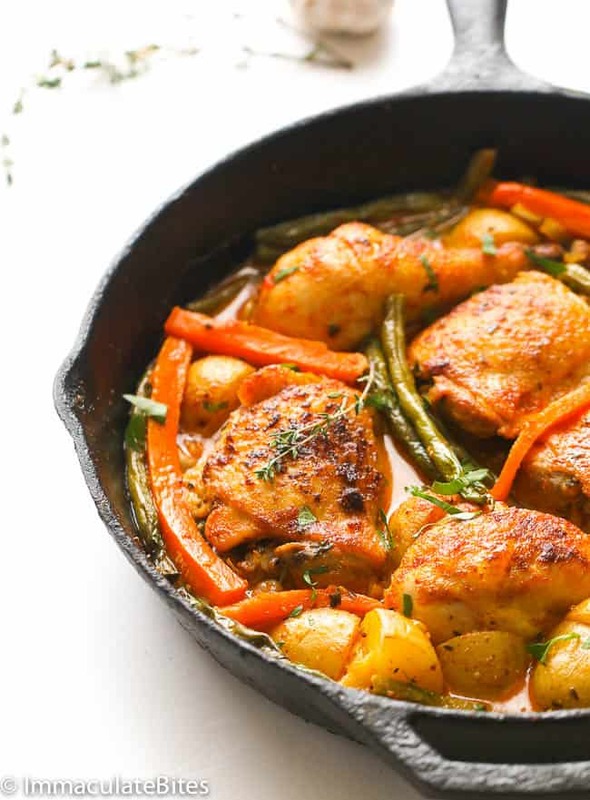 Seriously, who doesn’t like one-pot meals? You only dirty one pot although I may love to cook, I really don’t love to clean! Especially on weekdays when you have so much happening. 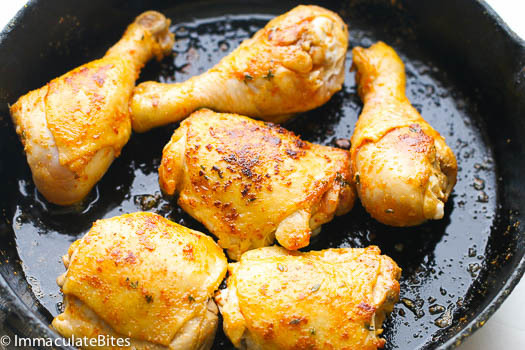 By the way, most of my chicken recipes involve thighs or legs because they are so dang affordable and don’t require much prep. You can always use whole chicken, like I do sometimes. 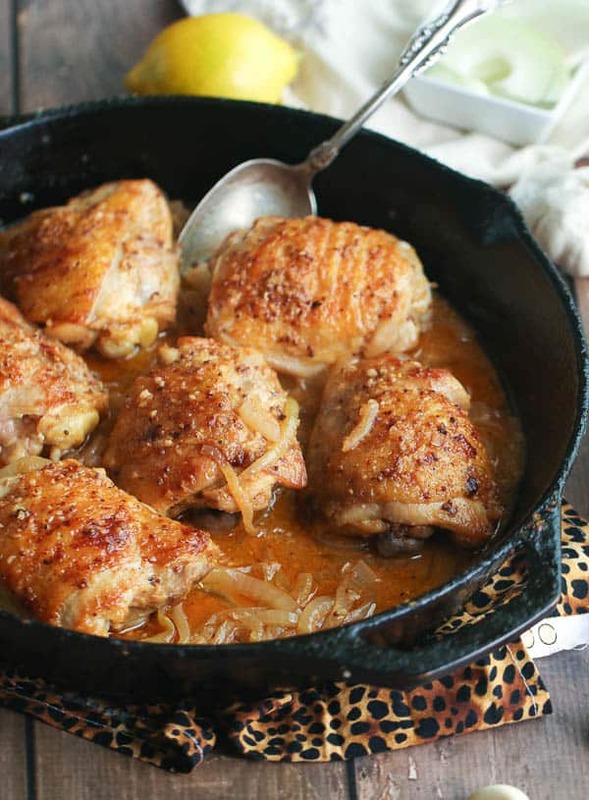 For the most part whenever chicken is involve, especially when making stews I like searing the chicken first; it caramelizes the surface of the chicken, which boost the flavor and makes the overall dish pretty darn tasty. I don’t know about you but flat and boring meals do not rock my boat. For the most part all it takes is an additional 10 minutes and you can easily make a distinction between both. 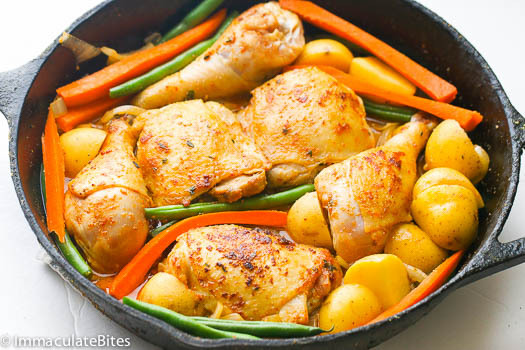 This recipe requires you use a skillet or oven safe cookware. Here, I used a 12-inch skillet. Also I marinate the chicken before searing. The first time around I used garlic, thyme and paprika. Second time around I went the Cajun route with creole seasoning and generously sprinkled with paprika. Feel free to use your favorite spice blend. 2 cups or more chicken broth or water. Trim chicken of excess fat and pat dry with a cloth or paper napkin. Season chicken with; garlic, thyme, salt and pepper. You may let it marinate, if you have the time. When ready to make, Pre-heat oven to 400 degrees. 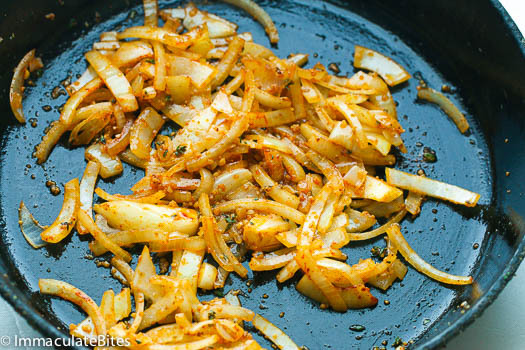 Place about 1 tablespoon or more of oil in a cast iron, or frying pan. Add chicken to the pan and sear for about 3-4 minutes on each side or until slightly browned, it’s going to finish up browning in the oven. Set aside. Add, mustard and about 2 cups chicken broth or water, bring to ta boil. Let it simmer for about 2 minutes. Adjust for seasoning. Remove from oven let it cool before serving. You may garnish with parsley. Marinate the chicken first before searing. Feel free to use your favorite spice blend. Trim chicken of excess fat and pat dry with a cloth or paper napkin. Season chicken with; garlic, thyme, salt and pepper. You may let it marinate, if you have the time. Sear chicken for about 3-5 minutes per side , be careful not to let it burn. When chicken is slightly brown. Remove and set aside. I understand that the chicken skin gets crispy and golden, and that it is delicious. 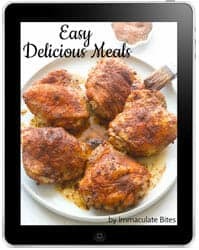 However, due to my family having to watch cholesterol intake, do you believe the flavor will change a great deal by using skinless chicken thighs? No it wouldn’t affect the flavor . It’ll work out just fine . May make it tonight or tomorrow. The flavor of this dish is also very versatile to change as well just changing one ingredient for another. 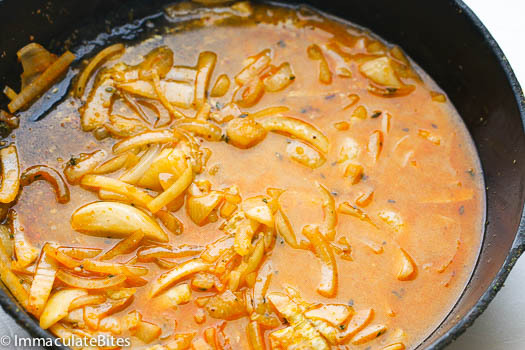 I can see a Curry and Harissa version of this dish and both would be awesome. As well can go Peruvian with Ají Amarillo (Yellow/Orange) Pepper sauce which is wildly popular in Peru and would also be great as that’s a great sauce. Just all different optional take on the same basic dish. Made this late last night. Amazed how simple a one pot dish it was. Got to use my big Cast Iron skillet too so that was great. Added in some Red Peppers just because I like to always improvise. But this dish was spanking delicious! This dish is a Big Winner! I don’t like to make same things over by any means always opting to try something different. But when will keep this one and likely keep changing it up for variety.? I’m going to have to try it in all the other variations eventually I’ve thought of Curry, Coconut Curry, Harissa, Aji Amarillo. hi, will try this tomorrow but have two questions: a) does it go in the oven uncovered? and b) at what temperature? Awesome Ginny!So happy to hear from you. Thanks for the feedback, it’s always appreciated. Love 1 pot meals!!! This looks delicious!! Seriously I am a fan of simple but tasty meals like this one – especially if you can mix and match spices to your taste. 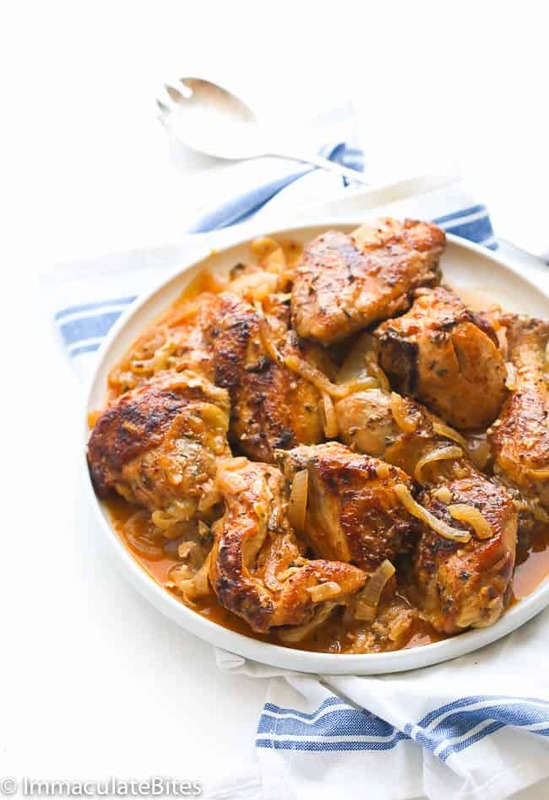 Yessss, chicken thighs are the best! 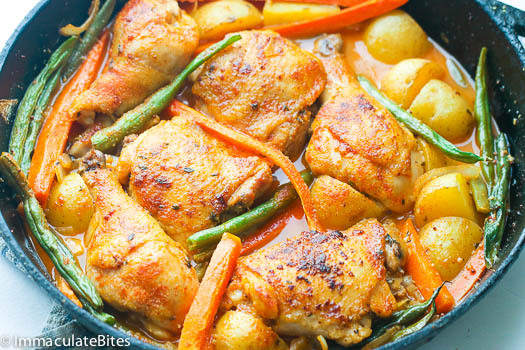 Loving this one pot meal, it looks so flavorful! 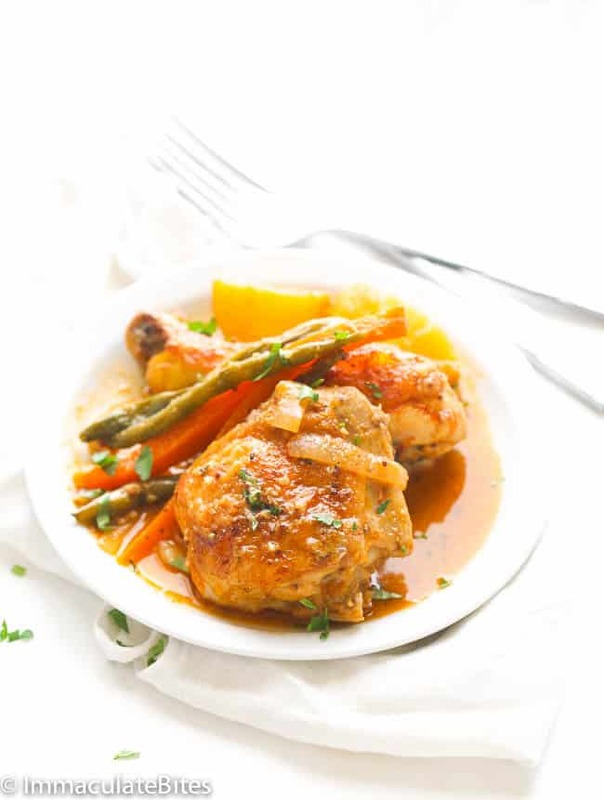 I really love braised chicken dishes. 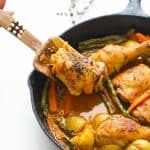 Such a gentle way to cook and this recipe looks great. Nice photo by the way. Yes to everything you say… lazy to wash dishes… browning meat first.. legs and thighs are a must! (My poor hubs.. who cares, right?) Looks so good. Yum yum yum! This looks absolutely delicious and fairly easy to make…it’s a keeper! Can’t wait to try! ummmm this is going to be made at my house really soon 🙂 always looking for new recipes with chicken. Also a one pot meal is great too. Totally Agree! One pot meals are the BEST!! Less Cleaning. This recipe is so simple and looks delicious! I have all the ingredients at home already….might give it a try over the weekend!! You are going to love this one Cassandra . Please let me know how it works out for you! I just tried out the recipe and it turned out great! Thanks! Cassandra, you are AWESOME!!!!! Thanks! Merci Anne! Je vais travailler a obtenir la traduction en français a l’ avenir. As tu essayer “google transate”?